Personalized Inspiration – your name, its inherent meaning and a scripture chosen from the King James Version of the Bible to inspire you. What is inherent? A quality or trait that comes with your name rather than its actual meaning. For example, Peter means “the rock”, inherently it means “steadfast, loyal, true”. 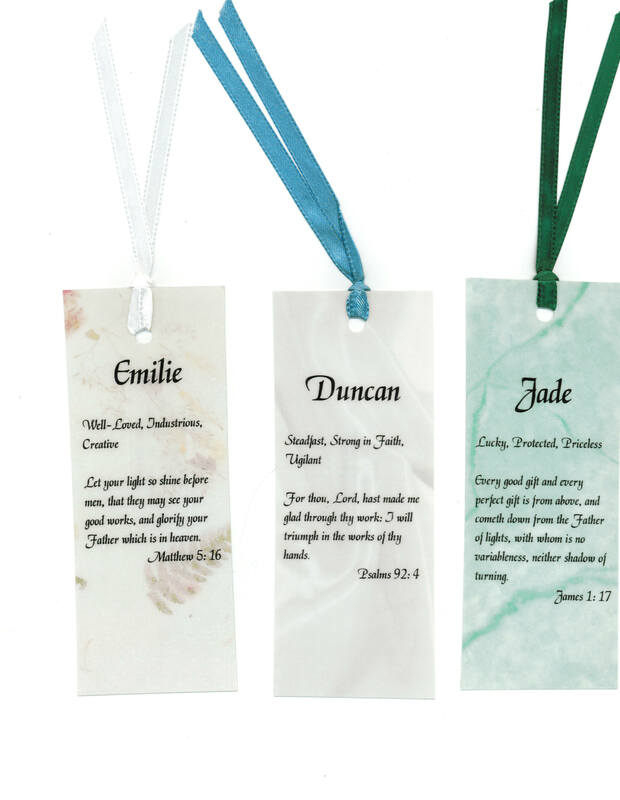 We offer several generic bookmarks. Some are as follows, feel free to ask if you need one that isn’t listed. Mother, Father, Grandmother, Grandfather, Elder (Missionary), Sister (Missionary), Friends, Scrapbooker, Secret Pal, Brother, Sister, Visiting Teacher, Home Teacher, Guardian angel. Paper style and ribbon colors vary and are chosen at random. Are these limited to first names? No, we do a lot of these with surnames, especially for family reunions! 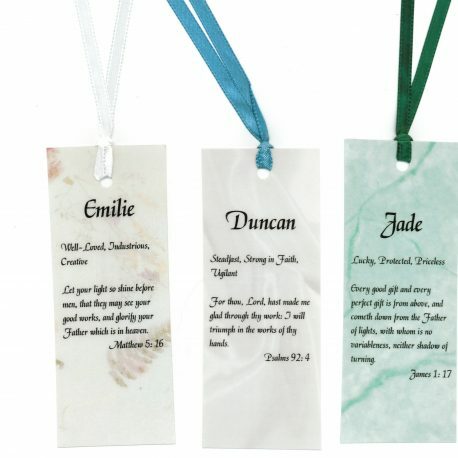 We also do “generic” bookmarks such as mom, dad, guardian angel, teacher, etc. We offer several generic bookmarks. Some are as follows, (feel free to ask if you need one that isn’t listed): Mother, Father, Grandmother, Grandfather, Elder (Missionary), Sister (Missionary), Friends, Scrapbooker, Secret Pal, Brother, Sister, Visiting Teacher, Home Teacher, Guardian Angel and more.